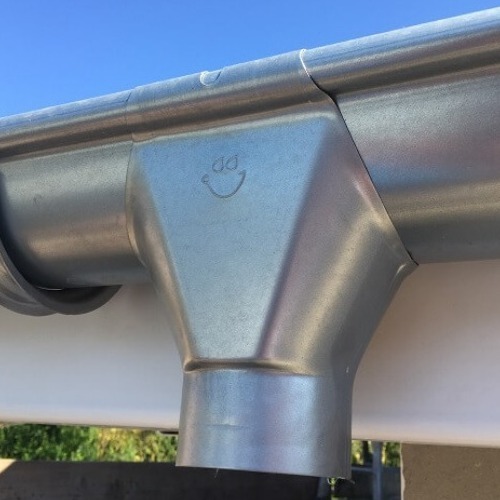 Our Galeco galvanised steel guttering is more than just rolled steel – it is superior quality galvanised Scandinavian steel that has been treated to a protective passivation coat prior to the addition of a final organic layer that contains chromium. The resulting finish is in our opinion superior to any other galvanised gutter system on the market, smooth and even with a deep lustre. Click here to watch a brief overview of the Galeco gutter system. Professional Building Supplies are delighted to be associated with Galeco, one of Europe’s leading Steel Guttering Suppliers. Made from the very best Scandinavian Steel, this system comes with a 35 year Structural Guarantee to give complete peace of mind. All of the colours shown below are held in stock, so all orders placed before noon for UK Mainland delivery will be delivered the next working day. The manufacturing process used to produce our steel gutter systems is actually quite complex. All of the colours available are subjected to the same initial process, and all are made from galvanised Scandinavian steel. A zinc layer is first added to the galvanised base metal, followed by a passivation layer. The purpose of this layer is to give extra protection against corrosion. This is followed by a primer coat and then the final organic paint layer. In the case of the galvanised finish, another polymer layer is then applied which contains Chromium. It is this chrome layer that gives Galeco galvanised steel its superior smooth metallic finish. The rolled front edge feature on the 100mm and 135mm gutter systems has two major benefits, in that it both increases the carrying capacity of the gutter and, unlike most other systems, it enables the gutter to be installed like PVC (with the back edge being inserted first), meaning that the guttering can be installed with the roof tiles already in place. All Galeco gutters and pipes come with a protective film which should be removed just before the products are installed. 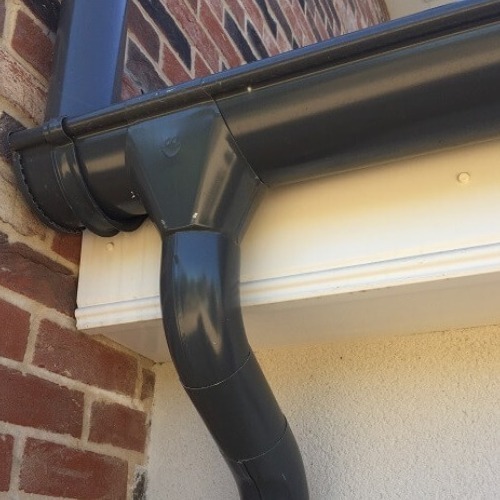 Unlike most of the alternative systems available, Galeco steel fittings incorporate rubber seals into all gutter angles in both the 135mm and the 100mm system. This avoids the need for additional unions at the corners, reducing the overall material cost and improving the appearance of the installation. Also exclusive to Galeco is the option of gutter unions with fixing brackets – most other systems use floating unions. Galeco side rafter brackets have been manufactured exclusively for the market in the UK. This allows the gutter system to be installed in open eaves situations such as barns, where there is no fascia board to fix to. Unlike any other system, the side rafter arms are actually painted to match the guttering – a first for the UK market. We currently stock three different sizes of steel gutters. The smallest system is our 100mm, which at 107mm internal is the equivalent in size to a standard half round or square PVC system, but with a slightly deeper profile. This is available in either our Galvanised or our Black painted finish. Our 135mm system is our most popular. Available in a choice of either galvanised, black, white, graphite or copper effect, this system has a large carrying capacity that exceeds all standard Deepflow or Ogee PVC systems, yet it does not look out of place on domestic installations. Our 150mm galvanised steel system is designed for use on commercial buildings, blocks of flats and large barns. 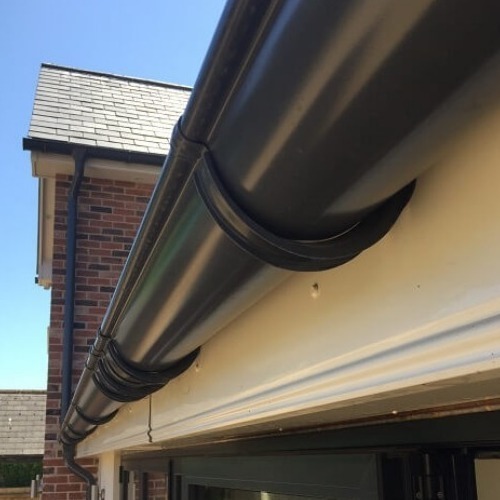 The very large carrying capacity of the gutter is combined with a 100mm downpipe to ensure that it can cope with the heaviest of downpours on the largest of roofs. And as all Gaelco steel gutters are impervious to corrosion, mechanical damage, UV radiation and all of the harmful acids and salts that are found in rainwater it will continue to do so for many years to come. Whilst steel guttering is installed slightly differently from UPVC, the process is fairly simple and no specialist tools are required other than a hacksaw and pair of snips or pliers. Please visit our Guides and Tips section where you will find Installation Instructions.